Mr. Van Trout is an average man. He lives in a McMansion in Quiggle Estates—the epitome of American Vulgaria, if one ignores the crazed serial killer Mr. Blankety Blank—with his wife, his wife’s haunted skeleton, his werewolf son, his nymphomaniac daughter and his silo. When you cut him, he bleeds—or goes into a 250 word tirade of questions, culminating with the hypothesis that he is in fact experiencing stigmata. And if you gave him a copy of Blankety Blank: A Memoir of Vulgaria by Harlan D. Wilson, he probably wouldn’t understand it, either. Published last month by Raw Dog Screaming Press, Blankety Blank falls somewhere between a portrait by Salvador Dali and a road map by M. C. Escher on the scale of clarity and understandability. From the “Egg Man” lyrics in the opening pages to Short Histories of the Silo, Werewolf, and Grand Rapids, the pages of plot are drastically outnumbered by pages of bizarrely hilarious tangents. Gongs rang in Mr. Van Trout’s ears. “The silo looks good!” he screamed. “You’re screaming,” the foreman told him. Mr. Van Trout tightened his lips. He cleared his throat a few times. He waited…“The silo looks good,” he said in a normal voice. What Blankety Blank comes down to—for this reviewer, at least—is not experimental literary technique as much as a 185 page joke. An amusing joke, alternately clever, ironic, satirical, surreal and uncanny—but a joke nevertheless. The question is, are you willing to pay $24.95 for a joke? 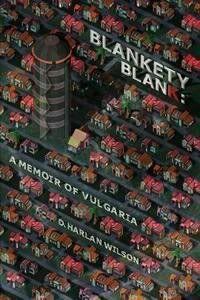 For more on the book, see the Blankety Blank page on D. Harlan Wilson’s website. Purchase Blankety Blank from Raw Dog Screaming Press or Amazom.com. Megan Arkenberg is a writer and poet from Milwaukee, Wisconsin. Her work has recently appeared in The Willows, Mindflights, The Fifth Di…, Scifaikuest and numerous haiku and tanka publications. When not writing, she divides her time between music, painting and editing Mirror Dance. What do you think attracts people to the fantasy genre? I think writers and artists are attracted to the idea that nothing is out of bounds; no setting is too strange, no character too eccentric. We thrive off problem-solving as we find new ways for our characters to interact with their world and with each other. Readers are attracted by humanity; they want to see interactions between real, human (in a broad sense) characters. Fantasy isn’t about escapism. It’s about discovering the fundamental pieces that make us human across all possible cultures and all possible worlds.